Last week Bernadette and I had the honor of judging a photo contest for a local elementary school. We were very impressed with the entries. The images were to be judged on three things. 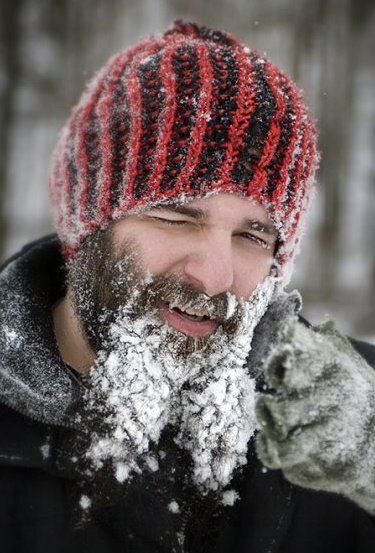 1) That the submitted image fit within the topic they were provided. 2) The creativity within the image. 3) The technical aspect of the image. The technical part was the easiest to judge, of course. We are trained to notice those details when printing. However, the other two presented a lot more difficulty. The topic the students were given was “The Magic of a Moment”. My mind automatically starts thinking of very complex scenarios. That is the angle I would take, because as adults we tend to complicate things, right? But, once those images were in front of me I was reminded that there is such beauty in the simplest of things! It isn’t necessary to have the most complex subject and the new trendy technique in order to create a beautiful image. While being so thankful for the reminder to appreciate the simplest of things, such as a field of sunflowers or a writing spider hanging from its web, I was also appreciative that these students were given the opportunity to express their artistic side. So much emphasis is put on basic educational knowledge (reading, writing and arithmetic) that I think society sometimes forgets about the “right brained” people. Don’t get me wrong, I most certainly think that the basics are extremely important but I also know that not everyone excels in that area. And those that don’t deserve to be able to excel and take pride in the areas that speak most to them, like the arts! So, all of that being said, f/32 is very proud to support adolescent art education and participation! We also proudly support simplistic beauty, so take a moment and take note (or photograph) the “magical moments” all around you! If only you knew the back story of actually getting this camera into our hands…well, I won’t bore you with that. The important thing is that it is here now and we are so excited to add this Canon 5dMarkIII to the rental program at f/32 Photo. Since it literally just arrived, it currently has no reservations on the books. So, who is going to be the first one to put it to good use? It is available for this weekend (or sooner if you need it) as of this writing. 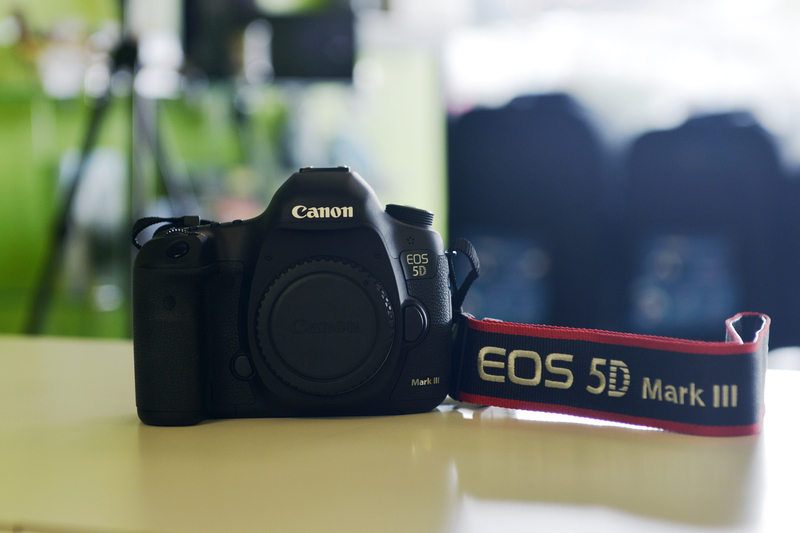 The rental rates for the Canon 5DMarkIII are as follows: 3 days – $150, 4 days – $175, 7 days – $199, and 10 days – $275. You can make rental reservations by calling us at 865-934-0909 or emailing us at print@f32photo.com. 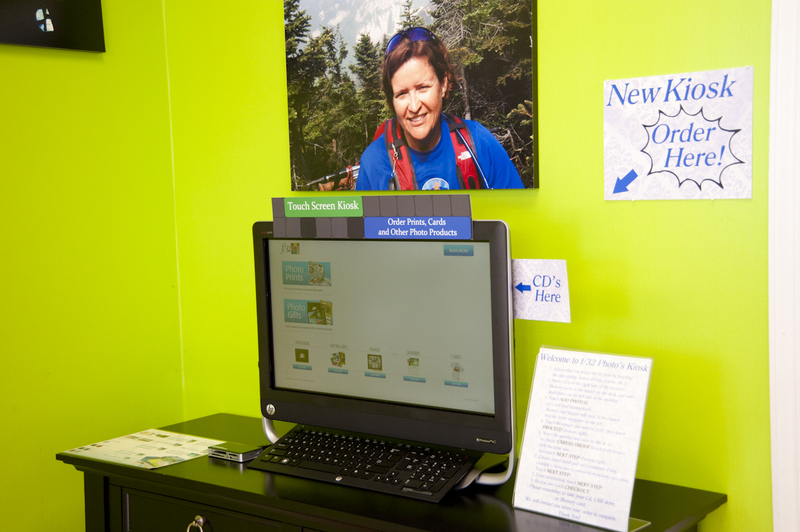 Wonder what else is offered through our rental program? Check out the entire listing on our website by clicking here. Thanks for renting with us! We will keep you updated here as we continue to add to our rental program as well as other services. Gallery Blocks Now Available at f/32 Photo!!! We are so excited to be able to now be able to offer Gallery Blocks to our customers! If you have never seen these in person before, be sure to check out our sample display in the store. The pictures online are nice, but the actual product is beautiful! 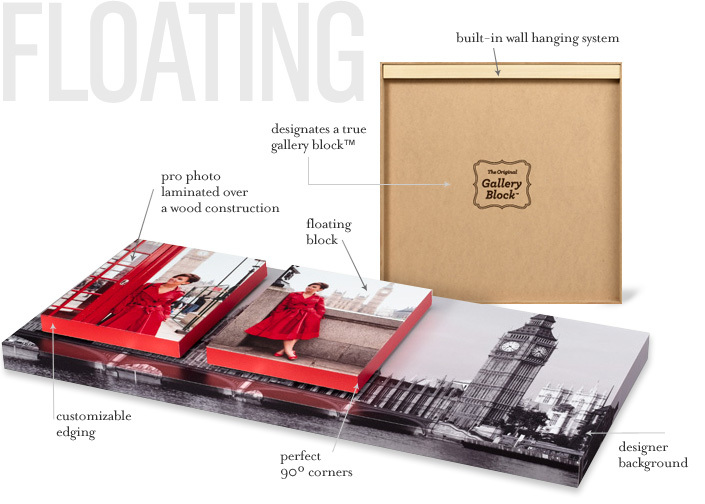 If you aren’t familiar with Gallery Blocks, they are constructed using a single professional print laminated over a solid wood constructed box. They have perfect 90 degree corners and come in floating and single varieties. The single Gallery Block is just that, one block (one inch in depth) with an image wrapped around it, ranging in size from 4×6 all the way to 24×36. The smaller single blocks come in sets of three. A “floating” Gallery Block is a series of smaller print blocks constructed together to create a one-of-a-kind piece of wall art. The floating Gallery Block is manufactured to look like each individual Gallery Block is floating over a large image background. We love the built in hanging system! 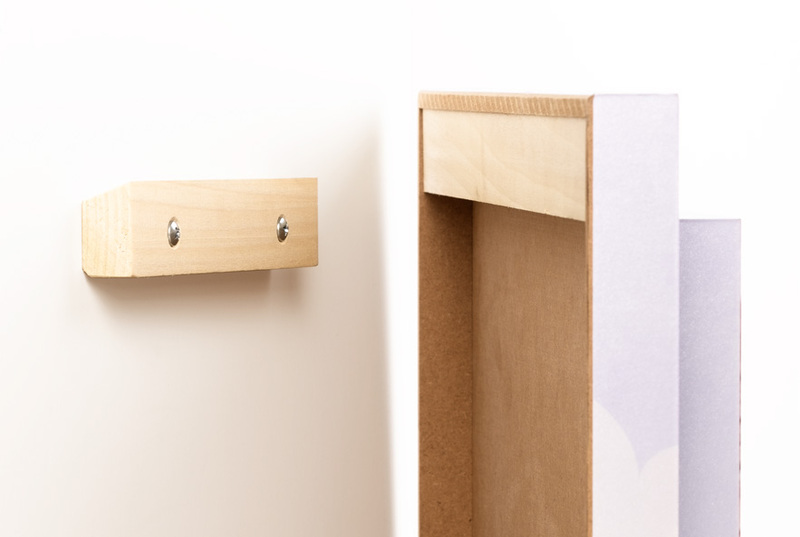 You can also purchase an optional hanging bracket that mounts flush to the wall with two drywall screws that are included in the kit. The creative possibilities with these products are endless! 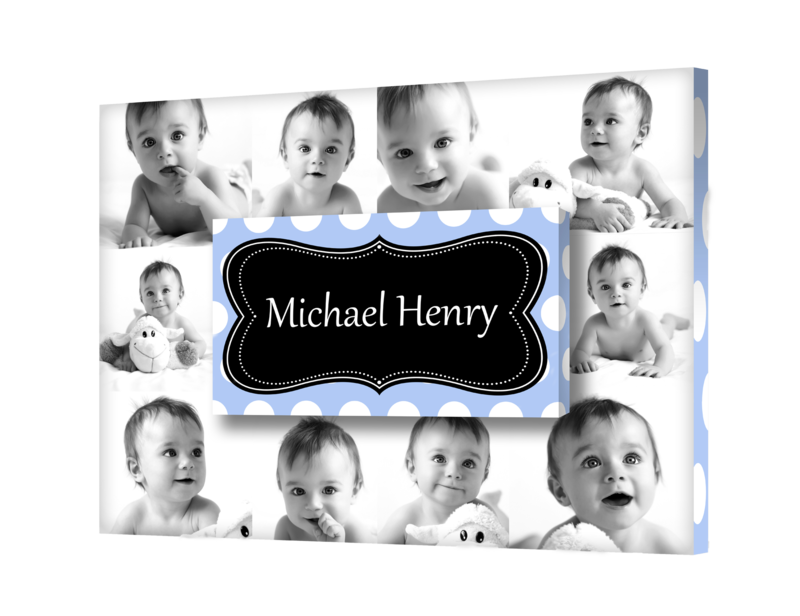 There are a wide variety of configurations available as well as a nice selection of templates pre-designed for each style of Gallery Block. Click here to see our catalog of available options and templates. Please note that the sizes of the Gallery Blocks and the orientation of the floating pieces in the various styles cannot be altered. However, the design can be completely up to you! You can choose from a pre-designed template, have us create a custom design for you, or ask us for the template guides to a certain style if you would like to create it yourself in Photoshop. Currently, Gallery Blocks can be ordered in person at our store. We are working toward having these available through our online ordering system, but we just couldn’t wait to bring them to you! This way, we can walk you through the process and help you figure out your configuration and design choice. In addition to the Gallery Blocks, we are also now offering Cube Decor. 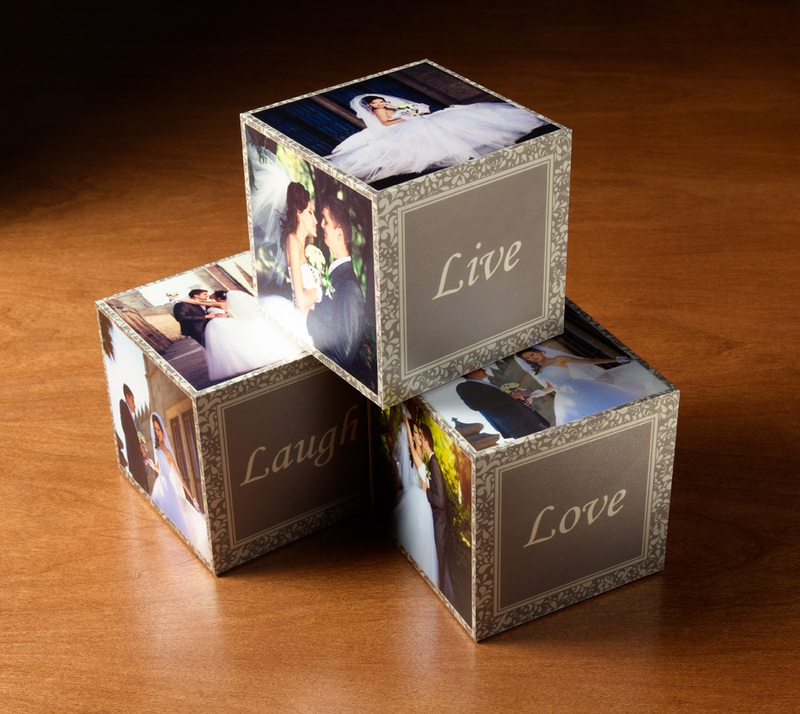 These cubes come in 4 and 8 inches and can be ordered individually or in multiple quantities. 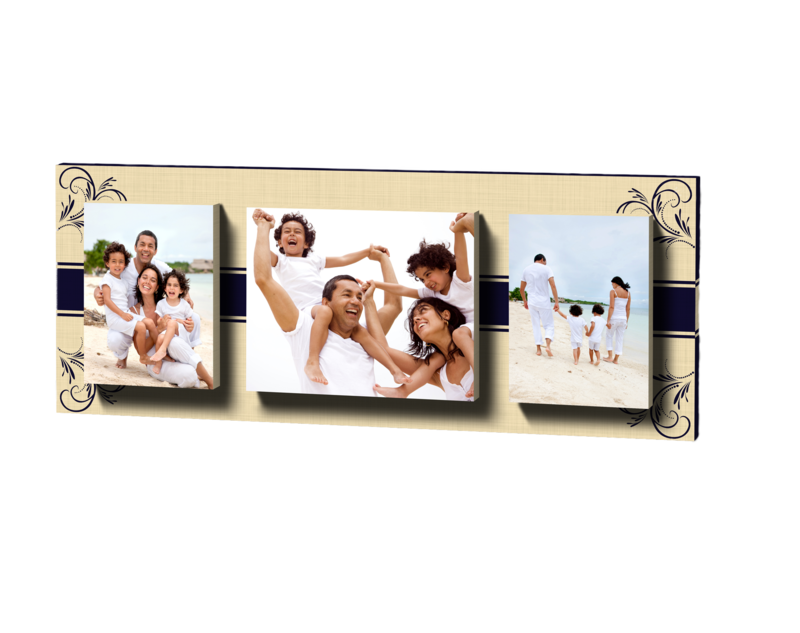 And finally, we are also now offering a line of frames called “Sweet Frames”. 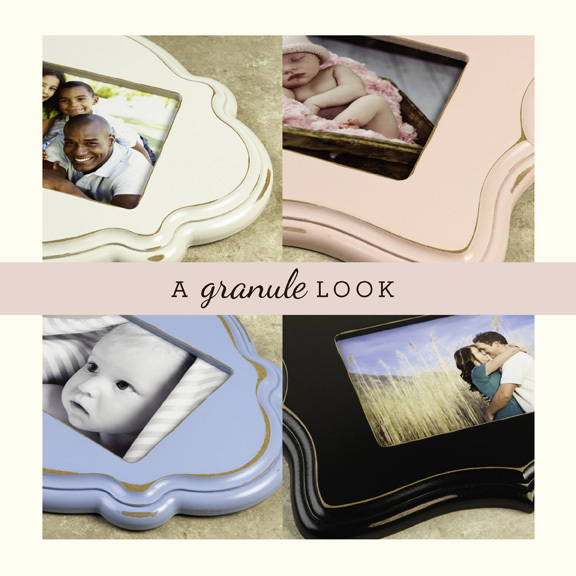 They come in two styles: Classic and Ornate, five sizes : 5×7, 8×10, 8×12, 11×14, and 16×20, and four color choices pictured below. Currently we are ordering these upon request. Wow, that’s a lot of new stuff at one time! If you are a professional photographer and would like to be able to offer these products to your clients, please talk to us and we will be happy to provide you with marketing information and sizing templates to create your own designs. I’ve been thinking about this a lot lately, this thing we call a “photographic community”. While Knoxville may be the third largest city in the state, it’s really one of those “large small towns”. Most photographers (and there are a LOT of us) here know each other, or knows someone who knows someone else. It may only be on Facebook, but most of us are connected in some way. When we work together to support each other and the craft, that is a powerful community. And while it used to be that photographers did not want to share their “trade secrets” or knowledge with other photographers for fear of training their competition, I really don’t see much of that anymore from my vantage point in the industry, which is refreshing. That brings me to the point of this post. A couple of weeks ago, the national AYSO soccer tournaments were in Knoxville and we had several people come into f/32 Photo to rent equipment for shooting the games. One day, we had two Dads with cameras who had brought their kids all the way from Utah and needed help in selecting and renting equipment that would allow them to accomplish what they wanted within their knowledge base and budget. So, as we talked about what bodies they would be shooting with, their overall photographic knowledge, and what they wanted to be able to capture in the time they were here, I was doing my best to draw on all of the sports photography tips that I have learned to help them make the best decision. Let me qualify that these were two incredibly honest and humble Dads who freely admitted that they had nice cameras but mostly shot on scene modes because they didn’t understand the manual creative modes. Hey, we all had to start somewhere. It’s much easier to work from the place of where someone actually is in terms of skill level and not where they think they are. So, I’m explaining how to shoot in Shutter priority (because I didn’t think I should throw metering and Manual mode at them in the beginning) and why it would be beneficial to them for what they were shooting. Now, I’m not a sports photographer, but I have had the privilege and opportunity to work with a great sports photographer in our area, Hobe Brunson, and he had taught me a thing or two that have really helped me. So, I’m trying to recall and regurgitate the things that Hobe has taught me when in he walks through the door. I asked him if he was in a hurry and if not, would he mind giving these two gentlemen some pointers. He graciously agreed and began discussing the best lens options for them, how to set their cameras, and how to shoot to get the best results. They took lenses outside and practiced with them, Hobe set up their cameras for them, and we even had to look a few things up since they had camera bodies that neither of us shoot regularly. At the end of the discussion, I even heard Hobe give them his cell number in case they had any trouble once they got to the games and couldn’t figure something out. He said that he didn’t know if he would be able to help them over the phone, but he would try. These are two people he had never met, would probably never see again, and gained nothing from how well their images turned out or not. Totally altruistic. It did my heart good to see a photographer that I respect and admire passing it on in such a way. A few days later, Hobe came in the store and told me that those two guys had sent him an email thanking him for all of his help. They also said that he made it look much easier than it actually was:) Hopefully, they captured some amazing memories for their kids though. That was their goal and what it was all about. I’m thankful that Hobe was there at the right time to help make that happen! New Items in the f/32 Rental Program!!! That’s right, a Nikon D800! It is fresh out of the box and we are so excited to introduce it into the rental program. The rental rates for the D800 are $160 for 3 days, $185 for 4 days, $230 for 7 days, and $305 for 10 days. Call now to reserve your spot! 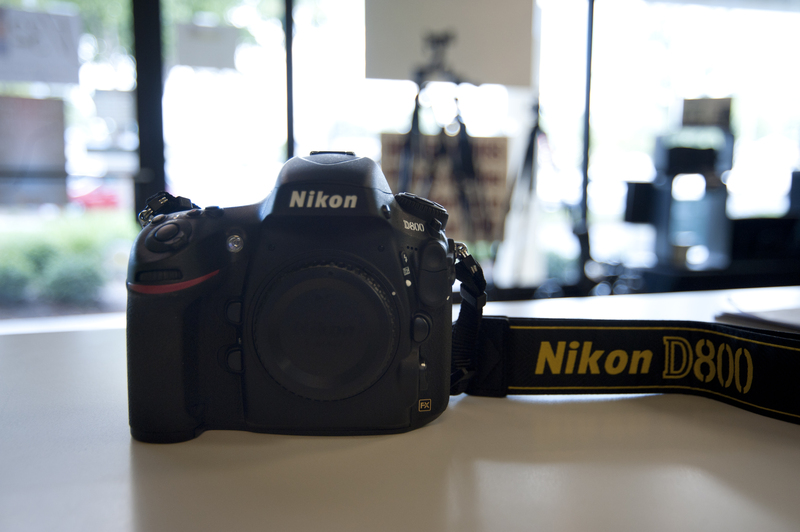 In addition to the Nikon D800, we have also added 2 new lenses to our rental program. If you have been curious of how the Sigma 24-70mm 2.8 lens compares to its counterpart in Nikon and Canon glass, you can now test it for yourself. We now have a Sigma 24-70mm 2.8 IF EX DG HSM for Nikon and Canon in the rental program. The rental rates for each of these lenses is $35 for 3 days, $40 for 4 days, $52 for 7 days, and $70 for 10 days. Renting a piece of equipment is a great way to give it a test drive if you are thinking of investing in it. In addition to providing Sigma equipment in our rental program, we are also Sigma dealers, so if you are thinking about purchasing Sigma equipment, we would love to talk to you and see if we can help you with anything you might need. We offer an incentive program as part of our rental program for anyone who rents a Sigma lens from us and then decides to purchase one. More details regarding this can be found here on our website. 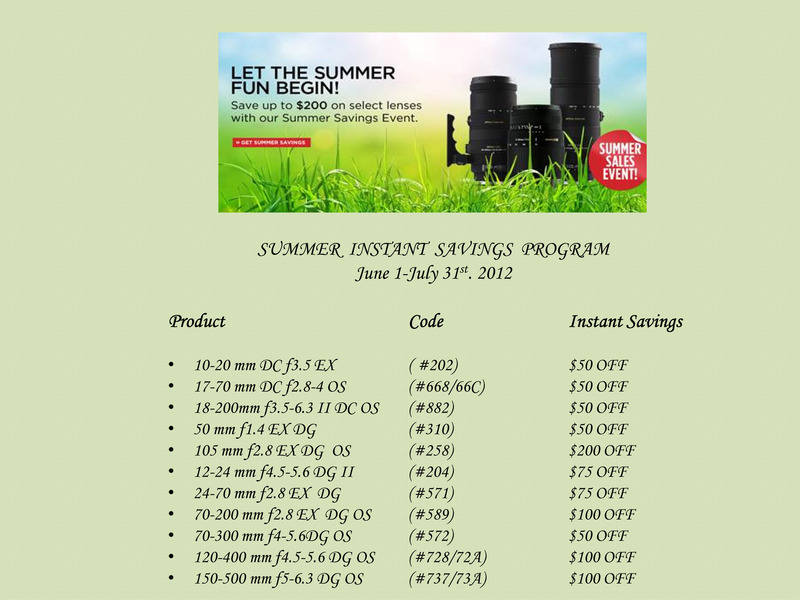 Sigma is also having a Sizzling Summer Sale on a variety of lenses. Now through July 31st you can receive a $75 instant rebate off the 24-70mm 2.8 lens! The MSRP is listed as $1400, but we have the 24-70mm 2.8 lens priced at $899. Add another $75 instant rebate to that low price and that is an amazing deal!